VINTAGE TOYS, BOOKS, CUTOUTS: Victorian Era Horse Tricycle, Arcade Cable Grand Piano, Arnold (US Zone Tank), Hubley (Cast Iron Grass Hopper, Cap Revolver Cal. 4.5, plastic Fire Chief Car, USN Propeller Fighter Plane, Champ Cap Gun & other Toys), Fleet Line The Dolphin Speed Boat with Evinrude Motor, Bristol-ware Snowman, J. Chein (Rabbit Pulling Cart, Sand Pail, Hercules Ferris Wheel with Key & Bell ca. 1930), Modern Toys/Japan X-2 Rocket, Schoenhau Hoffmeister Bisque Head German Doll, Ideal (), Newell & Daisy (Buck Rogers 25th Century Atomic Pistol, other toy Guns), MAR/Marx/Lumar (US Army Covered Truck Learn to Drive Windup Car, E12 Tin Tank, Atlantic City Souvenir Car, Tractor, Disney Wind-up Trains, electric Tin Train Set, Television/Telephone, Knock Down Target Shooting Gallery, Wee Scotty Wind-up Dog, Fire Dept. Chief Car, Tower Aeroplane with Box, Roy Rogers & Trigger Dodge Tin Litho Toy Horse Truck & Trailer), PEZ Space Gun, & Pop Eye (no feet) in original packaging with Candy & Paperwork, Automatic Toy Company (Rocket Space Ship, Hopalong Cassidy Wind-up Movie Wheel), IDEAL (Pirate Ship w/Accessories & Box, Fix-It Tow Truck, Electronic Fighter Jet, Futuristic Car of Tomorrow, Sir Galahad Knight in box, Rifle, Satellite Launcher, Turbo Jet Car, Robert the Robot, Hopalong Cassidy and his Horse Topper), Wolverine Sandy-Andy, plus Northwestern Products, Bandai Toys, Tin Litho Typewriters, Wind-ups, Telephones, Washing Machines, Gilbert Microscope, Fleischmann, Arcor Rubber items, Wyandotte Toytown Delivery Van, Doepke Model Fire Truck, REMCO (Whirlybird Helicopter, Johnny in the Barber Shop, Pom Pom Gun,, Big Max Electronic Conveyor), Mohawk Play Gas Pump, Tonka Toy Transport Tractor Trailer, Tyco (HO Scale), ACE Imp Co. Old Timer Tin Car in Box, Andy Gard Shooting Range with Box, Atlas, Plasticville Trains & Accessories, “Little Lady” Sink and Dish Washer, Banks, 1930’s Columbia Tricycle, Celluloid Dolls &other Novelties, Tell’s Vend-O-Mat Candy Machine, Televue Film Projector with Film Disks, View Master Projector, Miniature Globe (ca. 1940’s), Cast Iron hand-cranked Sewing Machine & Stove with accessories, Paper Popper Cap Gun, Hand Puppets, Children’s Reading, Pop-up, Coloring and Cutout Books, Auto-Wheel Coaster Wagon, Lawn Jarts, child’s Piano & Organ, Magnetic Bowling w/Box, Metal Masters Cars, Jefferson Philadelphia western Guitars, BVI Jig Saw Jr., Mattel (Mickey Mouse Newsreel, Machine Cap Gun, Swivel Shot Gun & Holster), Emenee Golden Glockenspiel, Courtland Modern Bakery Car, Fire Chief Car, Space Patrol Binoculars (Ralston Purina Premium), Paul Winchell’s Jerry Mahoney Ventriloquist Dummy with Box, Structo Flat Bed/Tow Truck, Irwin Round-Up Tex, Juro Celebrity Doll, Pink Lee in original Box, Marbles, Lionel Trainmaster Transformer, Wind-up Tap Dancer, Steiff Monkey, Superior Toy State Fair Pin Ball Machine, Howdy Doody & Mr. Magoo, Red Riding Hood, Wolf String Puppets Marionettes, Hand Puppets, Elenee Toy The Comet, Saunders Marvelous Mike Tractor, Strauss Ham and Sam Minstrel Team, Cast Iron Banks, Midwest Industries Propello-Pistol, Smith Miller Spot Light Mack Truck, Pressman Space Faces, T. Cohn for Pyro rare 1950’s Space Port Planetary Cruiser Patrol Building, Taftoy Helicopter, Mickey’s Air Mail Rubber Plane, miniature Ranger R.R. Tin Trains, Walt Reach Courtland Ice Cream Scooter, Prestige Toy TWA Electronic Piolet Trainer, Knickerbocker Dragnet Cap Guns, Kilgore, Texas Ranger and Stallion Round & Roll Caps, Hartland Dale Evans & Buttermilk, Roy Rogers & Trigger, Bullet, Tonto & Scout, Lone Ranger & Silver, Wyatt Earp & Horse, Lance O’Rourke Canadian Mountie, General Custer & Horse, Matt Dillon & Horse, Wyatt Earp & Jim Hardie, Gunfighters, Hopalong Cassidy Holster, Guns & Wristbands, Lone Ranger Chaps, Buck’n Bronc Cap Gun, Nichols Stallion 45 Mark II Cap Gun, Schwin Stingray, child’s Victrola & ride-on Airplane. VINTAGE EASTER, VALENTINE, HALLOWEEN & CHRISTMAS: German Papier-mâchéand Hand-blown GlassEaster Eggs, J. Chein Rabbits with Carts, Easter Glass Candy Containers w/Candy, Easter Baskets (Japan), Halloween Candy Containers & Horns, Collegeville Costumes in Boxes (with photographs), Halloween Post Cards, Victorian Glass Christmas Ornaments & Garland, Lighted Tree Stand, Good-Lite & Reliance, Santa Claus & Snowman Candy Containers early Santa Claus Ornaments, Santa & Reindeer Windup, Noma Christmas Lights, Evergleam Aluminum Christmas Tree, Celluloid Santa, Honeycomb, Mechanical, Pop-ups Valentine Cards (1930’s). JEWELRY: 10, 14K Gold, Sterling, Victorian, Costume (Sarah Cov, Monet, Weiss, Bakelite, Aurora Borealis, Swank, Hickok), Pinbacks, Hat Pins. GLASS: L. C. Tiffany Favrile, Baccarat, Pilgrim Cranberry, Murano, Fenton, Cameo, Carnival, Depression, Currier & Ives, Stemware, Blown, Cut & Pressed, Bottles. CHINA/POTTERY: ca 1700/1800’s Delft Tiles, Roseville, Wardle, Weller, Hull, American Indian Pottery (TAOS\Pueblo), Simon Pearce, Brush McCoy, Bavaria Plates, Hand Painted Nippon, Noritake, Blue Transferware, Fitz & Floyd, Lenox, Royal Albert, Capodimonte, Castleton Sunnyvale, Majolica, Stangl, Transferware, J. Pouyat Limoges, R. S. Prussia, Russel Wright, Ironstone, Art Pottery by Brian Dewbury & others, Salt & Pepper Shakers, Corning-ware, Watt Nesting Bowls, Antiquities, old Red-ware Baking Dishes and Plates. SIGNAGE: Beech-Nut Tobacco, Public Service, RTD, Los Angeles Bus Stop, Stop Sign, Danger, Rail Road, Second Pl., Push Door Signs, Advertising Atlas Wiper Blades Thermometer. TRANSIT: Trolley Headlights, Fare Boxes, LEVI’S Neon Sign. LADYS, GENTLEMEN & CHILDREN’S ATTIRE & ACCESSORIES: Quaker Hat, early Lady’s Bonnets, Hankies, Belts, Exquisite Lady’s Dresser Set (in original box/never used), Perfume Bottles, Derby Silver Co. Dresser Set, Men’s Stove Top Hats in Box, late 1800’s Children’s Clothing (as found), Edwardian/Victorian Children’s Button Leather Shoes (some with shoe boxes) Galoshes, Genuine Alligator Wallet, Tortoise Shell Hair Comb, Walt Disney Productions Child’s Umbrella, Men’s straight edge Razors, Shaving Kit & Knives, Fruit of the Loom Underwear, Handkerchiefs, WWII Army long Trench Coat, Pants, Shirts, USMC Holster. EPHEMERA: 1939 NY World’s Fair Puzzle & Brochures including The Story of Lucky Strike, original Chicago World’s Fair Poster, Autograph Books, Post Cards & Post Card Albums, Photographs, Letters/correspondence, personal Journals (primarily from the Washington, New Jersey area), Charles Dickens ‘A Christmas Carol’ Little Leather Library, Shepp’s Photographs of the World Book ca. 1891/1892, children’s Little Golden Books, Pictorial History of the World’s Great Nations Vols I & II, Pioneers in the Settlement of America, Vols. I & II ca. 1876, Valentines, Birthday, Get Well, Christmas Greeting Cards ca. 1940’s-1950’s, My Weekly Reader & Liberty Magazines, Victorian Era Scrap Books, loose Die Cuts, Trade Cards, Funeral Home Fans, Boys Life, Aladdin Readi-Cut Homes, Looney Tunes All Stars, Desert Storm, Marvel Comics, Pokeman Trading Cards, Farm Journals, Life & Post Magazines, Comic Books, ca 1940’s Newspapers, German Family Bible (Herzog ca 1860), 1950’s Baseball, Football Cards & Red Man Chewing Tobacco Baseball Cards, The Sinking of the Titanic & Great Sea Disasters 1912, The Curse of Drink 1910, Fraktur DOB 26 May 1848, Railroad & Aviation Matchbooks, Texaco Fire Chief Cardboard Mask (The Texaco Exhibit/Atlantic City 1934, Man’s First Landing on the Moon framed with First Day Cover Envelope and Stamp, Mortuary Photos, Piano Rolls, Public Sale Posters from 1875, 1893, 1913, NJ Residents’ Hunting and Fishing Licenses 1919-1921, NJ Driver’s Licenses 1909, 1910, 1912, 14, 16, 17, 18 & more, Vehicle Registration Cards 1907, 9, 13 & more, Salesman Sample Bible circa 1883 with color chromolithographs and hand-colored prints. EPHEMERA/TUCKERTON, NJ & AREA TOWNS: Tuckerton Stock Car Membership Card, Dr. Carmona, M.D., Tuckerton Bank Checks & Loan Pass Book, plus Businesses Invoices (Bay View Dairies, Bower Pharmacy, Harry T. Margraf & Son, Parkertown Garage, T. E. King & Son, A&P Tea Co., Alvin Cobb, Captain Sam Wilkinson, Rose M. Cranmer Insurance, Bob Leitz Pontiac, Bartlett’s Concrete Products, Tuckerton Auto Supplies, Everett J. Salmons Mason Contractor, Wally’s Amoco Service), High School 1948 Follies, & News Letters, Assignment of Tax Sale, Small Cause Court Complaints, Political, Certificate Honoring Member of Armed Forces, Business Accounts/Journal ca 1894-1901, Black & White Photographs of an automobile that was hit by a Train ca. 1920’s, black/white photograph of Stock Car Race held at Flemington Fair, 1962 with negative, and exterior and interior photographs of James Salt Water Taffy Store in Atlantic City with negatives, Tuckerton Beach Paintings. HOME DÉCOR ART & LINENS: framed Paintings (mid-nineteenth century portrait by U. Hoefer, Miniature Paintings on Porcelain) & Prints, Mid-Century Danish Modern Wooden Baskets,vintage Baskets,large selection of vintage Tins (Automobile, Spices, Beech-Nut Chewing Tobacco Store Tin, other Tobacco, Health Aid, Office, The Planters Peanuts) Salt/Pepper Shakers, Stoneware, Sterling Serving items, Clocks, Soap Stone, Bookends, Candle Holders, Ceiling Light Shades, Oil Lamps, Lamps, Slag Glass Shade, Oriental Tea Caddy, pair of Wicker Planters, vintage Quilts & Bedspreads, decorative Pillowcases in original unopened boxes, early framed Game Prints, Norman Rockwell framed Lithos (1972) . NJ & LOCAL APPEAL: Local Sea/Landscapes, Photographs, Ocean Grove Creamer, Decoys, Captain’s Mistress Game, Plainfield, Keyport, Washington & Point Pleasant NJ Bottles, Herter’s Tackle Box, Bamboo, Split Bamboo Fishing Poles, Fresh & Saltwater Lures & Weights, Fishing Reels (Jaleoxe, Asbury, Penn), Ship’s Lantern Anchor Light Great Britain 1919, Airplane Propeller recovered from marsh. PRIMITIVES: Tin Cookie Cutters & Ladles, metal Pie Safe, Acme Egg Grading Scale, Egg Shipping Crates & Carton, Wooden Gears, Folk Art Wooden Engraved Box, Saw Box, Crocks, Metal Bread Machine, 1930’s Oil Fill Can, Water Can, Blue Rock Trap, Coffee Grinder, Fireplace Pokers, Andirons, Wooden Crates, The ‘Fulton Sign’ & Price Markers, Slaw Cutter, Doctor’s Bags, Doll Cradle, Black Chalk Boards, Shoe Maker’s Tools in original Wooden Box, Flour, Chicken Feed & Dog Feed Sacks, Candy Mold, Lock with Key, Powder Horn Rattle dated 1832, Cast Iron Caldrons, cast iron Door Stops, Toilet Paper Mount, Lightening Rod, Walking Sticks, Shoe Shine Chair. BLACK AMERICANA: Aunt Jemima (Hubley) Soap Dish, cast iron Butler Tip Stand, F&F Salt & Pepper Shakers, Post Cards, Bull Durham Tobacco Posters, Clock, Banks. MISCELLANEOUS: 1868 Ferrotype Campaign Pendant/Pin of Ulysses S. Grant, other Ferrotypes (Tintype), Daguerreotypes, Political Memorabilia, 1930’s Coca-Cola Trays, Judaica, Silver-plate, Egyptienne Straights Cigarettes with National Flags Silks Tobacco Tin with Cigarette Silks, Textiles, Nikon, Canon, Chinon, Pentax, Wittnauer Cameras, Brass Bucket, collection of figural Wolves, Prosthetic Wooden Leg, Medical Bags, Ideal Model Boxed Kits, Brass Fire Extinguishers, Mississippi Queen River Boat/Prison-Folk Art, Powder Horn, Document Boxes, Empire State Building Statue Miniature, Jail Keys, Sons of Union Veterans of the Civil War Medal, Violin with case, V. Kohlert Sons Graslitz Clarinet (Paris no. 8509) with Case, Harp (Paramount Co.), vintage Cash Registers, Cigarette Lighters, Buttons & Sewing Notions, Tool Boxes and Tools, Trunk filled with Correspondence and Children’s Clothing, Foreign Coins & Currency, Liberty Council no. 16 O. U. A. M. Badge, Oil Lubricant for Aircraft & Machine Guns (1943), Edison Splitdorf, CB Radios, vintage large Bars of Ivory Soap, Kotex Sanitary Napkins, & Hand Towels, hand-wrought Slave Boat Shackles, Parkway Gum Ball Machine, Cigar Box, Roberk 4 Way Flasher, Auto Flator Compressor, Coolers, Coney Island Carousel Horse. Box Lots 9:00 a.m. Cataloged Items 10:30 a.m. ITEMS ARE TO BE PAID FOR AND REMOVED ON THE DAY OF THE SALE UNLESS OTHER ARRANGEMENTS ARE AGREED TO BY MANAGEMENT. ABSENTEE & PHONE BIDDERS CREDIT CARD BILLING WILL ALSO INCLUDE SHIPPING AND INSURANCE (WHEN APPLICABLE). ALL ITEMS ARE SOLD AS IS; WHERE IS, WITHOUT GUARANTEE OF ANY KIND, REGARDLESS OF STATEMENT OF CONDITION MADE FROM THE AUCTION BLOCK. BUYERS (INCLUDING ABSENTEE & PHONE BIDDERS) SHALL RELY ENTIRELY ON THEIR OWN INSPECTION AND/OR INFORMATION. NOT RESPONSIBLE FOR TYPOGRAPHICAL ERRORS. NO RETURNS. WINNING BIDDER BECOMES SOLELY RESPONSIBLE FOR ITEMS WON BY HIM/HER. THE AUCTIONEER IS RESPONSIBLE TO CONSIGNOR TO ATTEMPT TO GET A FAIR VALUE FOR CONSIGNED GOODS. THEREFORE THE AUCTIONEER MAY REJECT ANY BID NOT APPROPRIATE WITH THE VALUE OF THE LOT. THE AUCTIONEER RESERVES THE RIGHT TO REJECT THE BIDDING OF ANY PERSON WHOSE CONDUCT, ACTIONS, OR ADVERSE COMMENTS HE FEELS IS NOT IN THE BEST INTEREST OF THE SELLER. IN THE EVENT OF A DISPUTE BETWEEN BIDDERS, THE AUCTIONEER SHALL HAVE ABSOLUTE DISCRETION ON DETERMINING THE SUCCESSFUL BIDDER. AUCTIONEER RESERVES THE RIGHTS TO WITHDRAW ANY ITEM AT ANY TIME PRIOR TO THE SALE. Credit Cards and Paypal for on-line winners are accepted for payment. We require credit card information to bid. Division of M&M Antique Enterprises, Inc. Description: Roseville Pottery Pine Cone Vase #849-10 Inch USA. In excellent condition with no chips, cracks or flakes. Lot A. Description: Cobalt Blue Westmoreland Glass Dolphin Candlesticks. Both in excellent condition. Lot E.
Description: Baccarat France Rabbit Glass Paperweight. In excellent condition. Lot F.
Description: Lladro 5590 "Spring Breeze" In The Original Box. In excellent condition. Lot G.
Description: Fifty Two Inch 1930's Public Service Bus Sign. In great shape for its age. Lot K.
Description: 1960's PEZ Ray Gun Dispenser. In as found condition. Awesome Find!!! Lot O. Description: J. Chein & Co. Easter Bunny Pulling A Wagon Tin Lithograph (#1). Another treasure! Lot O. Description: 1950's Ford Fairlane Battery Operated Tin Lithograph Car, Made in Japan. Battery Compartment clean. Lot O. Description: 1930's Hubley Black Americana Mammy Cast Iron Soap Dish. Rare and outstanding! Lot O. Description: 1940's Marx USA Tin Lithograph Learn To Drive Wind Up Car. Lot O. Description: Outstanding 1877 Salesman Sample Bible. In excellent condition. One great find! Lot P.
Description: 1983 M & M Mars 1 Ounce Silver Commemorative Coin 25 Years in Hackettstown NJ. Lot S.
Description: Roseville Pottery Clematis Console Bowl #459-10" USA. In excellent condition. Lot T.
Description: Roseville Pottery Peony Jardinière #661-4" USA. In excellent condition. Lot V.
Description: Louis Marx Tin Litho Sky Hawk Tower Airplane Toy In Original Box. Outstanding Find! Lot Z. Description: Roseville Pottery Freesia Ewer 21-15" USA. In excellent condition. Lot A. 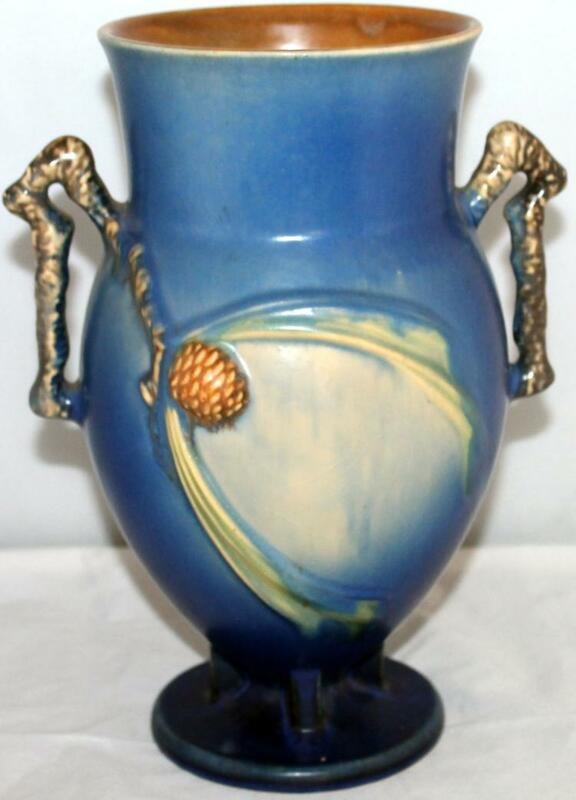 Description: Roseville Pottery Moderne Vase #803-14" USA. In excellent condition. Lot A. Description: Roseville Pottery Decorative Fish Ivory #1 USA. Has a few firing flaws, they are NOT chips. Lot A. Description: 1950's Public Service Bus Medallion Sign. Outstanding find! Lot K.
Description: #305 Tin Lithograph Rocket Space Ship Friction Toy c1950's. One of many great finds! Lot O. Description: 1933 Chicago Worlds Fair Century Of Progress Poster. In as found condition. Lot O. Description: J. Chein Easter Bunny Pulling A Wagon Tin Lithograph has original candy from the 1940's in wagon! Lot O. Description: Outstanding 1920's Dresser Set In Original Large Box. All brand new in the original case! Lot O.